At the Mendeleyev Journal we call this the “take a Communist to lunch day” cause you know that they sure as heck are too poor or too cheap to pay for it themselves. It was ninety-six years ago, in the city of Petrograd which we call Saint Petersburg again today, that on this day in history on Nov. 7, 1917 (Gregorian calendar) that Vladimir Lenin’s Bolsheviks overthrew the provisional government. The Bolsheviks gave power to locals committees, called Soviets, and thus began setting up the first communist government in Russia. 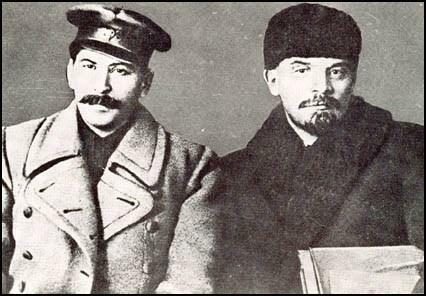 Stalin and Lenin in 1917. Russia was still on the old Julian calendar back then and so the date on their calendars was 25 October 1917. Russia and some parts of the Eastern world still observe some events, mostly religious, by the old calendar. 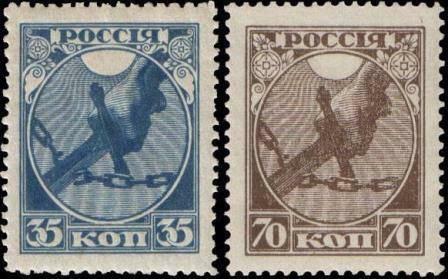 First postage stamps in the USSR showed a sword breaking the chains. The first postage stamps also used an “I” in the spelling of “Ra se ya” the name of Russia, a letter no longer found in the Russian Cyrillic alphabet. The name of Russia is still pronounced the same today but the modernized spelling is Россия as the letter и (e) has replaced the I. 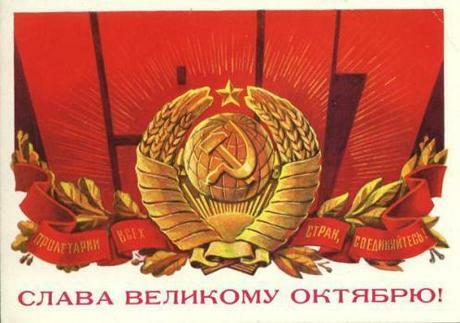 The first postage rule of the new Soviet Russia was that short handwritten messages could be sent by post for free but sealed letters and packages required the purchase of stamps. A hallmark of Communism is to offer freebies out of the state treasury as Communists aren’t bright enough to understand that aside from levying taxes, there is no money in a treasury until first it is confiscated from someone else. Frankly, there will be a parade of the Communist party in every city and photos and banners of Stalin will be carried around by old folk who yearn for the good ole days when a Jew could be sent to the Gulag just for being a Jew and when there was “order” which is a key word you’ll hear today by old Bolsheviks. The millions of executions, the starvation and the imprisonments seemed to have slipped some minds. This will be the only day of the year when anybody really cares about the Lenin mausoleum on Red Square. They’ll go home tonight and then nobody will care again until next year. Today Stalin holds better poll numbers than Mr. Lenin.